The number one skill that makes or breaks the success of a business is planning. Great CEOs have an exceptional ability to plan ahead and keep detailed records of everything, and they create a culture of attentiveness to detail throughout the whole company. One of the key planning tools for any business is the five year projection worksheet. There are three sections of the worksheet; the income statement, the cash flow statement, and the balance sheet. If you’re looking for a five year projection worksheet, you fill find a fully customizable version as a free download on the bottom of the page. This template is simple to use, and the following lists provide guidance that should answer any uncertainties. Starting with the current fiscal year, first you put your total sales, in dollars, for the year in the net year section. Next, you fill in the costs that those goods or services cost you in the costs of goods sold box. Subtract this number from the net sales. After that, fill that number into the operating income box. Finally, subtract your operating expenses from your net operating income and that gives you your net income for the year. 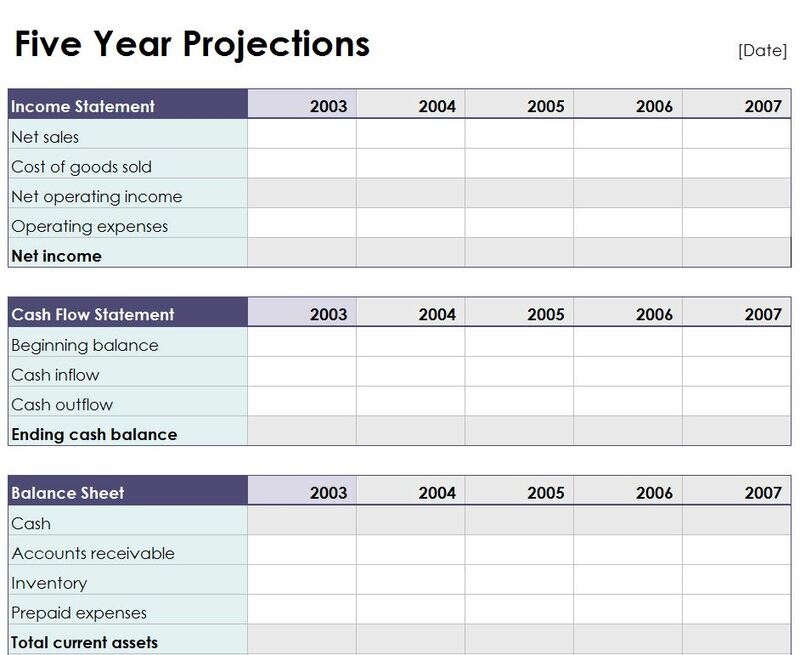 The next part of the five year projection worksheet is the cash flow statement. First, put the starting amount of cash in the beginning balance box. Next, add the amount of cash coming into your business to that number. After that, subtract the cash you spent from that number. The answer is your ending cash balance. The last part of the five year projection worksheet is the balance sheet. First, add up the cash, accounts receivable, inventory, and prepaid expenses. This gives you your total current assets. Next, add your fixed assets to this number and you have your total assets. After that, add up your accounts payable,short term notes, and accrued and other liabilities. This number gives you your total current liabilities. Next, and your long term debt and your other long term liabilities and you have your total long term liabilities. By using these numbers and your business goals you can fill out the rest of your five year projection worksheet. This gives your business a clear direction that will surely result in success for years to come.